My Ride Rules -- the SPEED's new reality car competition Executive Produced by Mark Roberts and Lorena David is showing all new episodes every Tuesday at 10pm EST and 7/11pm PST. Click here for more information. Click here for more information. Start your engines, fasten your seatbelts and hang on tight! The most unique car competition on television has arrived. Four high spirited car-lovers will battle to show that their ride rules the road! Welcome to MY RIDE RULES! Let’s face it… Everyone thinks their car is the best. 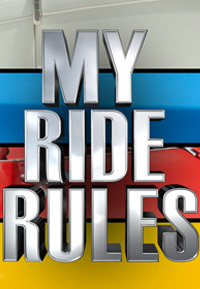 MY RIDE RULES will put cars and owners to the test. Each self-contained, half hour-long episode brings together four very different people who are equally obsessed with their cars. They'll show off its best assets and letting the others take it for a spin. During these test drives, our car owners must “put their motors where their mouths are” and prove to the rest of the drivers why their ride is the best… hands down! At the end of each test drive, the other owners award points for appearance, performance and overall vehicle personality. The driver with the most points at the end of the show wins the Come Drive With Me Trophy and $1,000 in cash. Whether you’re into Customs, Import Tuners, Hotrods, Low Riders, or pure American Muscle, this show is for you! Prepare yourself for a comedy-fueled, high-octane, inside look into the intense relationship between people and car. MY RIDE RULES! It’s the ultimate test drive.